V P Menon was the Constitutional Adviser to the last three Viceroys during British rule in India. He was the only Indian in Mountbatten's inner team. Menon's plan for the partition of India into two Dominions was the one which was eventually adopted. It was Menon who realised the need to get the Princely States to accede to India before the date of independence and that Mountbatten was the ideal person to facilitate this. When the communal violence began following independence, Menon asked Mountbatten to take charge. Menon and Sardar Patel later achieved the full integration of the Indian States. Menon has never received the recognition he deserved for his contributions and this paper is intended to highlight Menon's role during this crucial period in Indian history and to draw attention to his views on events and personalities. The events leading to the independence of India in 1947 are dominated by four of the major figures of the Twentieth Century, namely, Lord Louis Mountbatten, Mahatma Gandhi, Jawaharlal Nehru and Mohammad Ali Jinnah. There were other politicians, such as, Sardar Patel, Liquat Ali Khan, Maulana Azad and Baldev Singh who also played important roles. However, there was another participant who had a vital role, who, though mentioned in the accounts of the period, has never received the recognition he deserved. The forgotten individual is Vapal Pangunni Menon. V P Menon was the Constitutional Adviser to the last three Viceroys. He was the only Indian in Mountbatten's inner team. Menon's plan for the partition of India into two Dominions was the one which was eventually adopted. It was Menon who realised the need to get the Princely States to accede to India before the date of independence and that Mountbatten was the ideal person to facilitate this. When the communal violence began following independence, Menon asked Mountbatten to take charge. Menon and Sardar Patel later achieved the full integration of the Indian States. The last three Viceroys, Lords Linlithgow, Wavell and Mountbatten all valued his advice. Menon was present at many of the meetings successive Viceroys had with their own staff. He would have been aware of everything in connection with high policy that went on between the Viceroy and the India Office in London. He was uniquely qualified to judge their actions and motives in the context of the time. Menon was the only Indian who had such intimate knowledge of the facts and then wrote a detailed account of what took place. His two books on the 'Transfer of Power in India' and 'The Integration of Indian States' are quoted widely. However, another of his works entitled 'An Outline of Indian Constitutional History' has been seldom referenced. In the first two books, Menon is very factual and measured in what he says. In the third, he is much freer with his opinions and gives his most forthright judgements on some of the leading players. His assessment of Mountbatten, in particular, is illuminating. Furthermore, though there have been innumerable books and papers covering the partition of India, some of Menon's most interesting observations have been overlooked. Menon was also exceptional in that he came from a very humble background and yet reached the heights of the Indian Government Service. This paper is intended to highlight Menon's role during this crucial period in Indian history and to draw attention to his views. V P Menon was born in Malabar, Kerala in 1894. As a schoolboy, he ran away from home to spare his family the cost of his education. He worked in a gold mine in Mysore and then as an English teacher. In 1914 he joined the Government Service as an assistant in the Home Department. 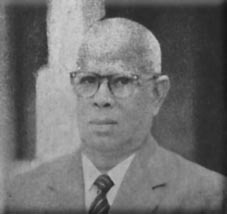 He was drafted into the Reforms Department and there by sheer brilliance and hard work became Deputy to Sir Hawthorne Lewis, Reforms Commissioner, in 1936. He had an encyclopaedic knowledge of everything to do with the Indian Constitution. He attended the Indian Round Table Conferences in London. He was loyal to the Government of India and to successive Viceroys, by whom he was entrusted with the closest political secrets but he was also a staunch Indian patriot and had the confidence of political leaders, especially Sardar Patel. When the post of Reforms Commissioner became vacant in 1942 following the departure of H V Hodson, there was some reluctance to appoint an Indian to a position of such intimate trust on political and constitutional matters. However, the Viceroy, Lord Linlithgow, had been so impressed by Menon's loyalty, judgement and technical knowledge that he was appointed to the post. Menon thus became the highest serving Indian officer in the Indian Government Service. Linlithgow's sentiments were clearly not mutual as on Linlithgow's departure, Menon says that Linlithgow's 7  years' regime - longer than that of any other Viceroy - was conspicuous by its lack of positive achievement. When he left India, famine stalked portions of the countryside. There was economic distress due to rising cost of living and shortage of commodities. On the political side, Menon quotes Sir Taj Bahadur Sapru's statement that the country was more divided than when he came. Linlithgow was replaced by Lord Wavell who also relied much on Menon's advice and Menon accompanied him to London several times for discussions with the British Government. Wavell appointed him as Secretary to the Governor-General (Public) and later as Secretary to the Cabinet. As Secretary to the Governor-General (Public), he was the only Adviser to the Governor-General as to the manner of exercising his control over the Governors of Provinces under the Government of India Act (1935). Menon was the Joint Secretary to the Simla Conference in June 1945. The conference failed because Jinnah insisted that all the Muslim representatives in the Executive Council should be members of the Muslim League. Menon felt that Wavell could have called the League's bluff. His failure to do so weakened the position of the Unionist Party Ministry in the Punjab and Jinnah emerged the unquestionable leader of the Muslims in the whole country. Menon did, however, understand why Wavell took a different approach. When Lord Mountbatten arrived as Viceroy in 1947, Menon was not initially included in his inner team, as Mounbatten brought several senior advisers from London to reinforce the Viceroy's Private Secretariat. Lord Ismay came to serve as Chief of Staff and Sir Eric Mieville as Principal Secretary. Alan Campbell-Johnson was appointed Press Attache. There was also a feeling that it would be difficult for an Indian Hindu to avoid being partisan during the tense negotiations for independence. Indeed, Mountbatten's Private Secretary, George Abell, wrote to Mountbatten saying that, though Menon was an old friend of his and had many fine qualities, he is now perceived as being close to Congress and should not be taken into confidence as fully as before. However, Menon's role completely changed following the events in Simla, described below, after which he became one of Mountbatten's most trusted advisers. Mountbatten's instructions were to try to obtain a unitary government for British India and the States through a Constituent Assembly set up in accordance with the Cabinet Mission Plan. However, if by 1st October 1947 he found there was no prospect of such a settlement, he was to report what he considered should be done to hand over power by June 1948. Menon describes how Mountbatten had a remarkably careful yet quick and business-like method of working. He set about most expeditiously and zealously on the path of finding an agreed solution for a united India but in course of his talks, particularly with Jinnah, he became convinced that there was no prospect of such an agreed solution. During their discussions on the 4th of April, Gandhi suggested that Jinnah should be called to form an interim government which should eventually take over. Jinnah could appoint whomever he liked into the Cabinet and Mountbatten should act as referee to ensure fair treatment for all parties. He further suggested that Mountbatten should stay on as the Head of the Indian State. Mountbatten expressed his profound sense of honour at the suggestion but said that he could only proceed if Gandhi could obtain full backing of Congress for it. Menon's advice regarding Gandhi's proposals was that Mountbatten could put the proposals to Jinnah but in the view of past history, Jinnah would be expected to reject them. He suggested that they should keep Gandhi in good humour and play for time. In the same note, Menon still considered that the ideal solution would be if the two parties could agree to the Cabinet Mission Plan. If that failed, it would be necessary to consider some form of Pakistan based on Muslim majority areas. They should then try to link Pakistan and India in respect of the three common subjects, namely, defence, external affairs and communications. This could be achieved either by Pakistan joining the Constituent Assembly like the Indian States at the stage at which the Union Constitution was drafted or by a treaty between the two states. Gandhi wrote on the 11th of April saying that he had been unable to get the agreement of Congress and was therefore was withdrawing his proposal. Having given up on the parties' agreement to the Cabinet Mission Plan, Mountbatten set up a committee consisting of himself, Mieville, Ismay and Abell to formulate an alternative plan. This group met the chief political leaders and, without laying a formal document, discussed in outline what was proposed. This was to transfer power to the provinces or groups of provinces for an interim period. These would then decide whether to join India, Pakistan or be independent. There would be some kind of central authority to deal with overall defence. Under this plan, the members of the Legislative Assemblies of Bengal and Punjab would meet separately in two parts to decide whether to partition the province. The plan also envisaged holding an election in the North West Frontier Province. The draft of the text was shown to Nehru and Jinnah. Ismay and Abell took the plan to London on the 2nd May. It was Mountbatten's intention to call a meeting of Party Leaders on May 17 to ascertain their reactions to the plan. Though Menon was not involved in the formulation of this plan, he was consulted on its content. Menon always opposed it and made that clear to Mountbatten's advisers. He particularly opposed the notion that the provinces should initially become independent. If the plan were finally accepted, he said that he would resign. At this stage, Lady Mountbatten had heard that disagreements had arisen and asked Menon to meet her. Menon explained the situation to her. She advised Menon against any hasty action and told him that the Viceroy and Nehru were going to Simla shortly and he should take this opportunity to put his arguments before them in a calmer atmosphere. It is interesting to consider why Menon was asked to accompany Mountbatten to Simla. The Simla trip was intended to be a short period of rest and relaxation. Nehru was invited for the same purpose. At that stage Menon was not part of Mountbatten's inner team. There was no obvious reason why he should have been taken. If Menon's presence in Simla was due to Lady Mountbatten's intervention, her actions would have profound consequences for both India and Britain. At Simla, Menon relates that he had for the first time an opportunity to explain his position to the Viceroy in person. Menon informed Mountbatten that during Lord Wavell's time, when it seemed that agreement between Congress and the Muslim League, based on the Cabinet Mission Plan, seemed impossible, he had attempted to devise a fresh approach to the problem. In December 1946 or January 1947, Menon said he had discussed the matter with Sardar Patel. Menon considered that a unitary India under the Cabinet Mission Plan was an illusion. The three-tier constitution would have been unwieldy and difficult to work. His personal view was that it was better for the country to be divided than gravitate towards civil war. He felt that the best solution would be that India should be divided into two central governments based on Dominion Status. By accepting Dominion Status, Congress would gain three advantages. There would be a peaceful transfer of power. Such acceptance would be warmly welcomed in Britain. Then it would be possible to continue to have the services of British civil servants and British officers in the Indian Army during the transitional period. Moreover, the Princes with their past associations with the British Crown, would be reassured and more likely to negotiate. Congress would be able to have a strong central government which would be able to withstand then centrifugal forces all too apparent at the moment and to frame a truly democratic constitution unhampered by any communal considerations. Sardar Patel had assured him that if power could be transferred at once on Dominion Status, he would use his influence to see that Congress accept it. This plan, with Lord Wavell's concurrence, was conveyed to the Secretary of State in London but it was not acted upon, though Mountbatten remembered having seen it before coming out to India. Nehru arrived in Simla on the 8th of May and stayed as a guest of the Viceroy at Viceregal Lodge. Mountbatten suggested that Menon should discuss his plan with Nehru. This he did and gathered the impression that Nehru was not averse to it. On the 10th, a conference was called by Mountbatten which was attended by Nehru, Mieville and Menon. Mountbatten asked Menon to outline his plan to Nehru. Menon started by saying that he had mentioned the plan to Nehru the day before and to Patel about four months earlier. Both were extremely anxious for the early transfer of power. Mountbatten indicated that, though originally June 1948 was the target date for the transfer of power, under the new scheme it was hoped to bring the transfer forward by almost a year. The broad outline was that the Muslim majority areas should be separated from India and power should be transferred to two central governments, each having its own Governor-General. The interim constitution of each of the Dominions would be based on the Government of India Act 1935, suitably adapted for the purpose. The existing legislature would be dissolved and replaced by the respective Constituent Assemblies. Nehru gave his own reaction to the scheme that it was very desirable that there should be transfer of power as soon as possible on a Dominion Status basis. The basic reason for wanting early transfer of power, apart from the fact that Indians wanted to control their own affairs, was that developments in India would not otherwise take place as they should. However, the possibility of a divided India constituted a real difficulty. On the same day the Viceroy received from London the plan taken by Lord Ismay as finalized and approved by the British Cabinet. This embodied certain important modifications and Mountbatten was worried that these worsened the prospect of the acceptance of the plan by the party leaders. On a hunch he decided to show it to Nehru. Nehru turned it down most vehemently, first verbally, then in writing. Mountbatten was stunned by Nehru's reaction but in this moment of calamity, he switched to Menon's plan. They had another meeting with Nehru. After listening to a restatement of Nehru's objections to the plan received from London, they proceeded to explain how Menon's plan would meet these objections. At the end of the meeting, Mountbatten asked Nehru whether Congress would accept the new plan. Nehru replied that he would have to see it in draft before he could commit himself. In view of the new developments, the conference of party leaders called on the 17th May to discuss the London plan was postponed till the 2nd June. After the meeting with Nehru, Menon returned to his hotel. He had only two or three hours to produce the draft plan as Nehru was leaving Simla that evening and Mountbatten was keen that Nehru should see it before he left. Meanwhile Menon kept Sardar Patel informed of the developments in Simla and Patel was delighted by the turn of events. The Viceroy informed London, and officials there were bewildered as to why the plan they had just sent to India was being replaced by another one. Mountbatten was asked to come to London to explain. This he did on the 18th May, taking Menon with him. Before leaving for London, Mountbatten felt he should have the consent of the party leaders for Menon's plan. Menon drew up a draft 'Heads of Agreement' on the 16th May. After the Viceroy had approved the draft, Menon showed it to Nehru, Patel and Baldev Singh and Mieville did likewise with Jinnah and Liquat Ali Khan. Mountbatten had further consultations with all the main leaders and they all accepted the general principles of the plan. Commentators sometimes refer to Menon's plan as a redrafting of the earlier plan taken to London. This is not so. Menon's plan had a separate genesis. Documents at the time refer to it as 'Menon's plan'. In London, Mountbatten obtained the agreement of the British Government and the Opposition to the new plan and he and Menon returned to India on 31st May. After further meetings with the party leaders, Mountbatten held the historic meeting on 3rd June at which the plan was formally accepted by them. Campbell-Johnson recounts a social event shortly afterwards at which Mountbatten paid a very high tribute to V.P. (Menon), saying that he had really come to love him and he had one of the most statesman-like minds he had ever encountered. He then recalled the element of chance which brought V.P. and his ideas to the fore. The turning point was the visit to Simla in May and Mountbatten's hunch to show the earlier plan to Nehru. This had given V.P. his chance to submit the alternative draft with its Dominion Status formula. V.P. had confessed to him that when he first put up the idea at staff level only to have it turned down, he almost burst into tears. George Abell had been the first to admit that Mountbatten's vision and good sense in bringing V.P. right into the policy-making fold had been perhaps the biggest single personal factor in the success to date. Menon's first task following the historic agreement was the preparing and finalizing the draft Indian Independence Bill, in consultation with the Viceroy and his advisers. In India, Menon, as Reforms Commissioner, was in charge of the Bill. Though the Bill consisted of only twenty clauses and three schedules, Menon suggests that its size bore no indication to the amount of labour that went into making it. In connection with the production of the Bill, Menon acknowledges the very able assistance rendered by Sir George Spence, K.V.K. Sundaranan and S.V.R Cook. Without their help, it would not have been possible to deal so satisfactorily with the Bill and the adaptation to the 1935 Act for India and Pakistan in the short period of time at their disposal. Menon pays a special tribute to Sir George Spence: 'In my opinion, in all my thirty-seven years' service in the Government of India, there was none among the many distinguished Law Secretaries who occupied so outstanding a position as did Sir George, respected and trusted by the British and Indians alike'. The Indian Independence Bill was passed by the House of Commons on 15 July 1947 and receive Royal Assent on 18 July. Menon describes the final stages of the Bill keeping the India Office as well as the Viceroy and his advisers practically sleepless for two nights. Menon's second crucial intervention was regarding the Princely States. During British rule, the Princely States had entered treaty arrangements with the British under which they accepted the presence of a British Resident in their capital and a degree of subordination to the Raj, but were not fully absorbed into British India. This system of paramountcy was administered by the Political Office and in 1947 the Political Adviser to the Viceroy was Sir Conrad Corfield. There were 565 Princely States and the vast majority were in India and only a handful in Pakistan. Though under the central provisions of the 1935 Government of India Act, the States were meant to accede to the Indian Federation, in reality, by 1947 no progress had been made. The British position, as stated in the Cabinet Mission Plan, was that paramountcy could neither be retained by the British Crown nor transferred to the new Government at independence. Mountbatten's instructions from Attlee regarding the States were that it was important that the Indian States should adjust their relations with the authorities to whom it was intended to hand over power in British India and he should aid and assist the States in coming to fair and just arrangements with the leaders of British India as to their future relationship. The view of the Political Office and Sir Conrad Corfield was that there was no doubt that the eventual future of most, if not all, States lay within a united India. But the Viceroy would be doing a great disservice to the Princes by urging them to accede before the transfer of power. If paramountcy were to lapse, the States would be in a far stronger position to negotiate with India. The Muslim League position was that the States were sovereign entities before they entered into treaties with the British and at independence they were free to decide their future. The Congress position was that paramountcy should be transferred at independence to India. Menon pointed out to Mountbatten that the lapse of paramountcy threatened not just the political unity of the subcontinent but also its economic life as agreements affecting railways, customs posts and irrigation would disappear. Mountbatten's own ideas on what his role should be were rather vague. On the evening of the 3rd June, when he met the States' negotiating committee, he said that he did not wish to give any official advice on what steps should be taken by those States which were doubtful whether or not to join either Constitutional Assembly. He would be willing to give personal advice to anyone asking for it. He did suggest that, in coming to their decision, they should cast their minds forward ten years and consider the country and the world at that time. He also confirmed during the press conference on 4th June that Dominion Status would not be conferred on any State wishing to be independent. Matters came to a head on 13th June when Mountbatten had a meeting with the party leaders to discuss the future of the States. At this meeting, Nehru claimed that Corfield and the Political Office were acting in a highly damaging way to India's interests. After a long and acrimonious discussion, the political leaders and the Viceroy decided to set up a new States Department to deal with all matters concerning the States especially the formulation of a Standstill Agreement covering immediate relations after the transfer of power. There was no suggestion at that stage that Mountbattten should do anything personally. Sardar Patel told him that after independence the people would rise and overthrow their rulers and rally to independent India. Nehru was equally intemperate declaring that he would encourage rebellions in all the States that go against us. Mountbatten was delighted to hear a few days later that Sardar Patel was to head the new department with Menon and his Secretary. Menon was initially uncertain whether he should take on the new post. He considered that Indian independence was the achievement of his life's ambition and he wondered whether to retire at that stage. But Patel persuaded him that he should work to consolidate the freedom of the new nation. Since he was still Constitutional Adviser to the Mountbatten, he discussed his new appointment with him and it was decided that he should carry on with both posts. Menon had deep misgivings about the position regarding the States. He, too, was unhappy at the lapse of paramountcy. Up to then the British had protected that States from internal unrest. There were only a few States that were organised to deal with such a threat themselves. He was concerned in case the communal disorder in British India spread to the States. He was also concerned that some Princes might cast their lot with Pakistan or assert their independence. He realised the need to forge a bond between the States and India prior to independence. He discussed with Sardar Patel that the lapse of paramountcy could have an advantage. They could negotiate with the States unhampered by existing treaties. He mentioned to Patel that in 1942 during Lord Linlithgow's time, he had suggested asking the States to accede only on defence and external affairs without any other commitments. They could try a similar proposal now but could add communications as well. If they could persuade the States to accede on these three subjects before partition, the basic unity of India would be achieved and when the new Constitution of India was framed at a later stage, they could thrash out the necessary details concerning the long term relationship between the States and the centre. Provided they did not demand any financial or other commitments, the rulers would not be unwilling to consider such a proposal. Menon requested Sardar Patel to put this plan to Nehru and get his approval. Sardar obtained it but Menon got the impression that neither Sadar nor Nehru thought anything would come of it. Menon further suggested seeking the active co-operation of Mountbatten. Apart from his position, his grace and his gifts, his relationship with the Royal Family was bound to influence the Princes. Sardar Patel wholeheartedly approved and urged Menon to approach Mountbatten without delay. A day or two later, Menon met Mountbatten and mentioned his discussions with Patel and their tentative plan. He asked for Mountbatten's help in getting the States to accede on the three subjects. He pointed out that they would not be losing anything as a result and it would be great act of statesmanship on Mountbatten's part if he could bring it about. Menon felt that Mountbatten was deeply touched by his remark that the wounds of partition might to some extent be healed by the States entering into a relationship with the Government of India and he would earn the gratitude of generations of Indians if he could assist in achieving the basic unity of the country. Mountbatten told Menon that he would think the matter over. Menon was momentarily seized with fear that Mountbatten might be adversely influenced by his advisers but to Menon's relief and joy, Mountbatten accepted the plan. Mountbatten realised that this approach held the key to an amicable settlement with Congress. Mountbatten then discussed the plan with Sardar Patel who told him that he wanted a 'full basket of apples'. Menon reports that when he told Corfield that the Government of India had decided on the policy of accession, he literally threw up his hands in surprise. A few weeks later, Corfield resigned and left India. Menon assumed the Secretaryship of the States Department on 5th July and one of his first tasks was to prepare a statement which Sardar Patel wished to release. The statement was very statesmanlike and emollient. Menon says that the inspiration for some of the passages came from Abraham Lincoln's first Inaugural Address. The statement appealed to the Princes to accede on the three subjects. It went on: 'This country with its institutions is the proud heritage of the people who inhabit it. It is an accident that some live in the States and some in British India, but all alike partake in its culture and character. We are all knit together in bonds of blood and feeling no less than of self-interest. None can segregate us into segments; no impassable barriers can be set up between us. I suggest that it is better for us to make laws sitting together as friends than to make treaties like aliens'. Sardar Patel met the Princes many times and gave fulsome support to the process but much of the detailed negotiations with the Princes was left to Mountbatten and Menon. The Chamber of Princes assembled on 25th July and Mountbatten gave one of his most impressive performances. He spoke without notes and Menon describes his performance as the apogee of persuasion. He hammered home the message that this was an opportunity that would never be repeated, that their internal autonomy would be protected and that the bargain was so advantageous to the States that even now he was not sure that he could persuade the Indian Government to accept it. He stressed the urgency of the situation and said; 'If you are prepared to come, you must come before August 15'. He concluded with the cogent appeal: 'You cannot run away from the Dominion Government which is your neighbour any more than you can run away from the subjects for whose welfare you are responsible'. By then the States Department had produced a draft Instrument of Accession and revised the original draft of the Standstill Agreement prepared by the Political Department. These drafts were circulated to the Princes. There were three versions of the Instrument of Accession depending on the existing status and powers of the States. Intensive lobbying of the Princes followed. By August, only a few has failed to sign. Many of the Princes were at first unwilling to sign; but eventually succumbed to a combination of Menon's threats, bluff, skillful diplomacy and sheer exhaustion. The Nawab of Bhopal threatened to abdicate in favour of his daughter and tried to sign the Standstill Agreement without actually acceding. The Maharajah of Indore blustered and threatened but in the end sent the Instrument of Accession through the post. The Maharajah of Jodhpur threatened to join Pakistan. Mountbatten and Menon eventually persuaded him to join India but not before he pulled a pistol concealed inside a fountain pen and threatened to shoot Menon. By the day of transfer of power, or shortly thereafter, apart from a few States clearly destined to join Pakistan, of the 565 Princely States all but three had signed the Instrument of Accession. These three were Junagadh, Hyderabad and Kashmir. By the policy of accession, Menon and Mountbatten had ensured the unity of the country. India had become one federation with the Provinces and States as integral parts. The Standstill Agreement had provided the basis for retaining intact the many agreements which had been built up over nearly a century for ensuring that all-India interests were safeguarded and which, with the termination of paramountcy, had threatened to disappear and in the process throw the whole country into a state of confusion. All this was done in an atmosphere of cordiality. Menon describes his own feelings in the following terms: 'My feeling was one of profound thankfulness to God. The threatened fragmentation had been averted and the whole country had come under one political umbrella. The prophets of gloom who predicted disruption had been belied. We had obtained a breathing space during which we could evolve a permanent relationship between the Government of India and the States'. Menon is very appreciative of the efforts of both Sardar Patel and Mountbatten: 'The masterly handling of the rulers by Sardar was the foremost factor in the success of the accession policy. The rulers soon came to recognize him as a stable force in Indian politics and as one who would give them a fair deal. Added to this, his unfailing politeness to the rulers, viewed against his reputation as the 'Iron Man' endeared him to them and created such conditions that they accepted his advice without demur. Another factor that went a long way in winning over the rulers was, of course, the infectious charm and the inborn tact of Lord Mountbatten. It was because of his abundant love for India, and not merely because he was obliged to do so, that he had taken upon himself the task of negotiating with the rulers on the question of accession. And once he undertook any task, he invariably put the whole weight of his personality into what he was doing and spared himself no effort. Half-hearted methods and half-hearted measures are alien to him. India can never forget the magnificent service he rendered at a critical juncture in her history'. An incident arose during this time which demonstrated the closeness between Mountbatten and Menon. Mountbatten, during a meeting, made an injudicious, casual remark to Bordoloi, the Chief Minister of Assam, on whether Darjeeling would end up in India or Pakistan. Bordoloi misunderstood the remark and rushed over to Gandhi and there was consternation among the Congress leadership. The result was Menon had to dash into Mountbatten's bedroom, the next day, full of alarm. Mountbatten was able to explain the whole thing and soon was able to laugh it off with the Congress leaders. Campbell-Johnson mentions that Mountbatten regarded this incident as revealing, as if he had not established such a close relationship with Menon, such that Menon could dash straight into his bedroom, this petty misunderstanding could have developed into a major crisis. Menon was also involved in the controversy concerning the announcement of the Radcliffe Awards. Sir Cyril Radcliffe had been appointed as the Chairman of the Punjab and Bengal Boundary Commissions which decided upon the borders between India and Pakistan. On the 9th of August, it was apparent to Mountbatten's staff that Award of the Punjab Commission was ready to be handed over. Mountbatten decided not to announce this award prematurely as he wanted to announce both Awards after the Independence Day ceremonies. Menon was not present at the meeting on the 9th when this decision was taken. It has been suggested that Menon might have been deliberately excluded from this meeting. There is no logical basis for this assertion. The fact that he was not present does not necessary imply that he was deliberately excluded. It is perfectly possible that he was away on States Department business or that he had some domestic matter to deal with. There is no reason to suppose that he was not told about it the next time he was back at work. Menon never complained that he was being kept in the dark. Indeed he says that Mountbatten always ascertained his reaction on any matter of importance. Menon was definitely present at the more important meeting on the 12th August by which time the full Award was known. Menon informed Mountbatten that the Congress leaders would be furious that the Chittagong Tracts had been awarded to Pakistan and that they might not attend the formal Independence Day ceremonies and celebrations. On the basis of this, Mountbatten delayed the announcement of the whole Award till the 17th August. It is interesting to note that the Radcliffe line was largely based on a line proposed by Menon and Sir B N Rau in the previous year. Immediately after the Boundary awards were known, large numbers of refugees started moving and there was a frenzy of communal violence. This was initially mainly in the Punjab. A Punjab Boundary Force had been formed prior to independence but it was overwhelmed by the violence. On the 27th of August, Menon informed Mountbatten that there was a great feeling on both sides that the new Governments should have more direct military control of their respective areas. A few days later the Boundary Force was disbanded. At this stage Mountbatten was a constitutional Governor-General who should not have been involved with the day-to-day running of the country. He left for a few days to Simla. By now the violence reached Delhi and conditions deteriorated to a serious extent. Menon felt that it was essential that Delhi should be saved from the impending chaos at whatever cost. Danger to the capital meant a threat to the very existence of the Dominion. It was clear to him that some extraordinary and forceful action was needed to retrieve the position. He felt that only Mountbatten's presence in the capital could save the situation. Menon mentioned to Sardar Patel his idea of ringing up Mountbatten to tell him how serious the situation was and requesting him to return. Sardar Patel readily agreed with Menon's suggestion and assured him that Nehru would also agree. Following his telephonic request, Mountbatten returned to Delhi and Menon explained the situation. It seemed that Menon misled Mountbatten slightly during the phone call. Mountbatten was given the impression that both Sardar Patel and Nehru requested his return whereas only Sardar Patel was aware of Menon's intentions. Hence Nehru was surprised to see Mountbatten but nevertheless agreed that he should take charge. An Emergency Committee was set up and both Nehru and Patel insisted that Mountbatten should be Chairman. Order was eventually restored after 3 to 4 months but not before there was a horrific death toll. Menon is very appreciative of Mountbatten's actions during this period: 'It is to the eternal credit of Lord Mountbatten that he agreed to take over the helm of responsibility at that crucial stage, and it redounds to the statesmanship of Nehru and Patel that they unhesitatingly and confidently offered it to him'. Menon also has much praise for Lady Mountbatten: 'After all these years, if anything stands out prominently in my mind, it is the service rendered by Lady Mountbatten, and also Mrs Sucheta Kripalani, whose zealous work for relief of refugees was beyond praise. Lady Mountbatten formed and became Chairman of the United Council for Relief and Welfare and her organizational abilities were recognized by all who had the privilege of being associated with her'. After the immediate crisis resulting from the communal violence had abated, Menon's efforts were directed towards the problems created by the three recalcitrant States, Junagadh, Hyderabad and Kashmir. Junadagh was a coastal State, close to Pakistan but surrounded by Indian States. It had a Muslim Nawab who ruled over a predominantly Hindu population. The Nawab surprised everyone by acceding to Pakistan. India adopted the policy of exerting maximum direct and indirect pressure on the Nawab by stationing troops around Junagadh without actually entering it. Menon was deeply involved with the negotiations to resolve the situation and went to Junagadh with a personal message for the Nawab from the Indian Cabinet. Matters were eventually resolved when the Nawab fled and the Dewan appealed to India to take over the administration of the country before it collapsed into chaos. A referendum was held in February 1948 which showed that the overwhelming majority of the population wished to accede to India. The non-accession of Hyderabad was a much more serious problem than Junagadh. Hyderabad was India's largest state with a population of nearly 16 million. It was far more capable of being an independent country. A Muslim Nizam ruled a largely Hindu State. The Nizam had the backing of Jinnah but his most potent ally was his Constitutional Adviser, Sir Walter Monkton. Menon was intimately involved with the negotiations which proved to be protracted and tortuous. Monkton frequently represented the Nizam at the negotiations and given his loyalty, it became inevitable that the discussions between Monkton, Mountbatten and Menon were sometimes stormy. Before the transfer of power, the Hyderabad delegation pressed for permission to negotiate a Standstill Agreement without executing the Instrument of Accession but Menon told them that the Government of India would not agree. The negotiations divided into three phases. The first ended with the signing of the Standstill Agreement on the 29th Nov 1947. The second ended with the violent attack on Hindu travelers on a mail train in Hyderabad. The third centred around the Heads of Agreement drawn up by the indefatigable Menon. He sometimes acted as direct negotiator, sometimes as Mountbatten's right-hand man, always as the one intermediary who would reliably represent and tirelessly persuade Sardar Patel, who was much less conciliatory than Nehru. However, the Nizam would not even sign the Heads of Agreement document. There was increasing violence in the State and on September 13 1948, Indian troops were sent inside Hyderabad. The Hyderabad army surrendered on the 17th September. Kashmir was the opposite of Hyderabad: a largely Muslim State with a Hindu Maharaja. Mountbatten had advised the Maharaja to establish the will of the people and accede to India or Pakistan by August 15 but he did not do so. Shortly before the transfer of power, the Government of Kashmir announced their intention of negotiating Standstill Agreements with both India and Pakistan. Pakistan signed one. But Menon says that India wanted to examine the implications and left the State alone. Menon adds: 'We did not ask the Maharaja to accede to India. Owing to the composition of the population, the State had its own peculiar problems. Moreover, our hands were already full and, if truth be told, I for one had simply no time to think of Kashmir'. Based on Menon's statement, in the period leading up to the transfer of power, it is apparent that the States Department was not particularly concerned whether Kashmir acceded to India or not. Matters came to a head on 24th October 1947 when Pathan tribesmen invaded Kashmir from Pakistan. Menon was immediately sent to Srinagar to have discussions with the Maharaja but he found the Maharaja in a state of panic, preparing to flee. Menon advised him to go to Jammu and take his family and valuable possessions. It was also apparent to Menon that the State forces were in danger of disintegration. He flew back to Delhi. The decision was taken to send in Indian troops but Mountbatten insisted that the State should accede to India before doing so. Menon flew to Jammu and obtained the Instrument of Accession signed by the Maharaja. There is continuing controversy whether Menon obtained the Instrument of Accession before or after Indian troops went in. On his return to Delhi, after long discussions, it was decided to accept the accession of Kashmir, subject to the proviso that a plebiscite would be held when the law and order situation allowed. Menon was involved in the subsequent diplomatic efforts to find an agreed solution between India and Pakistan but the problem has still not been resolved. In addition to dealing with the three States that did not accede, during the next two years, Sardar Patel and Menon flew around the country persuading the Princes who did accede, to move from the Standstill Agreement to full integration. They cajoled, browbeat and manipulated all the Princes, old and young, sane and mad, Hindu and Muslim, Sikh and Buddhist, to give up control of their ancient hereditary kingdoms. Attempts by leading Nawabs and Maharajas to unite or dictate their own terms failed because of their internal arguments and indecision. In most cases, gentle flattery was enough. The Maharaja of Cochin only signed after Menon promised him that he would still receive free copies of the Panjangam - the annual state almanac. By the time the new Constitution of India came into force on 26 Jan 1950, Menon and Sadar Patel had integrated all the States and brought them into the same constitutional relations with the centre as the Provinces. By partition, India had lost 364,737 sq.miles and a population of 81.5 million. By the integration of States, an area of nearly 500,000 sq.miles was added with a population of 86.5 million. It has been suggested that though Mountbatten gave the impression that signing the Instrument of Accession did not preclude the Princes from retaining a degree of autonomy after independence, this was, in fact, unlikely and full integration was inevitable. Several of the decisions that were taken before independence are still very controversial and Menon has addressed some of them. Menon's views are particularly valuable as he witnessed the events first hand, had access to much of the documentation, attended many of the meetings Mountbatten had with his personal staff and was consulted frequently by Mountbatten. He was thus uniquely placed to describe the events that took place and judge the actions of the participants. Regarding whether sufficient precautions were taken to prevent the communal violence, Menon gives the following explanation: 'We had anticipated that there might be communal trouble in the border districts directly affected by partition, but we felt that the Boundary Force of mixed composition under Major-General Rees, an enormous and carefully picked body, would be able to cope with the situation. As for the rest, we had no reason to believe that the Governments concerned would not themselves be able to control any sporadic outbursts that might occur in their respective Dominions. We had the guarantee of the political leaders as set out in their joint statement of 22 July, as also the specific assurances in regard to the protection of minorities given by Jinnah in his address to the Constituent Assembly and in his broadcast to the people of Pakistan. It is true that the situation was full of foreboding; but we had not expected to be so quickly and so thoroughly disillusioned'. There has been considerable criticism of Mountbatten's decision to bring the transfer of power forward from June 1948 to 1947. Menon's view on this is unequivocal: 'There are critics who argue that if the transfer of power had taken place in June 1948, as originally planned, instead of August 1947, the bloodshed that followed immediately after partition could have been avoided. It is easy to be wise after the event. When in July 1947 the communal situation looked like getting out of hand, Lord Mountbatten took the precaution of getting assurances from Congress, as well as from the Muslim League, that the minorities would be protected in their respective Dominions. These assurances were repeated by Nehru as well as by Jinnah on the day the respective Dominions were established. Had both the Dominions stood firmly by their pledges, would it have made any difference whether the transfer of power took place in August 1947 or in June 1948; and if it were not the purpose and policy of one or other of the Dominions to adhere to its pledge, could not the catastrophe that occurred immediately after August have happened equally in June 1948?'. He makes a similar point elsewhere: 'There are critics who argue that the acceleration of the transfer of power was responsible for the partition disturbances and that Mountbatten should have waited for the original date June 1948. They are entirely ignorant of the situation especially in the North India as it was then. If he had waited for ten months more, what guarantee was there that a bloody revolution would not have taken place and there would have been no power left to be transferred In the course of the last twelve years, since retirement, I have consulted both official and non-official friends of mine, some of whom were in the Punjab at the time. They all agree that, in the situation as it was, delay would have been more dangerous than the early transfer of power'. Menon adds that if he had thought of it at the time, he would have suggested the 20th of August as the day for the transfer of power as that was the 30th anniversary of Edwin Montagu's momentous announcement that responsible government was the goal of British policy. It has also been suggested that there should have been an exchange of population before the date of independence. Menon has addressed this suggestion: 'Then again, it has been said that if a planned exchange of population had been arranged before the transfer of power, the communal holocaust would have been avoided. But could there be any question of an exchange of population between two sides which had agreed and publicly announced that they would retain their respective minorities? Indeed, Congress was definitely against any exchange of population. The Sikhs and Hindus would never have entertained the idea of leaving their homes in the West Punjab. Nor, for obvious reasons, could the British Government have enforced it. The question of exchange of population could only have been raised, if at all, after the Dominions had come into being. But no sooner had the Dominions been established than communal frenzy broke out, resulting in the disastrous consequences already described'. Menon makes measured criticisms of all three parties whose actions led to the partition of the country: 'Though through the centuries many attempts had been made to bring India under one central Government, it is the proud claim of the British that it was they who first time created an Indian Empire, extending from Kashmir in the north to Cape Cormorin in the south, and from Baluchistan in the west to Assam in the east. It is a sad reflection that the British who achieved that unity could not bequeath it to their successors. But sadder still is the thought that Jinnah, the hero of my generation, a great nationalist in his time and one who fought many a battle for the freedom of his country, should later have fought so successfully against its freedom, and eventually, almost single-handed, have brought about its division'. He is critical of the British for their statement made during the Cripps Mission: 'It was at this stage that the British Government, in their declaration of 1942, gave the right to the provinces to accede or not to the Union and even to form a separate Union or Unions. This was a radical departure from the policy hitherto adopted. In the discussions leading up to the passing of the Government of India Act of 1935, it had never been contemplated that the accession of the British-Indian provinces to the Federation would be optional. This was really the death-blow to Indian unity, and subsequent assertions of their preference for a united India by British authorities carried no weight. It was definitely a victory for Jinnah'. Menon's main criticism of Congress is regarding their decision to resign from the Provincial Ministries in 1939: 'While it is easy to appreciate the indignation of the Congress, and to agree that any protest would have been justified, it must be said that the resignation of the Provincial Ministries as a means of protest was a wrong. It is a supreme example of that unrealistic negative politics in which we are all too prone to indulge, and the outcome of which is, sometimes, very disconcerting, and even disastrous. The control of eight Provincial Governments, covering half the country, had put Congress in a position of great strength and bargaining power. The Congress should have thought many times before voluntarily abandoning such an advantage. Actually, the outcome of the resignation of Provincial Ministries in 1939 was far more unfortunate than could have been foreseen, for, among the more serious consequences of this monumental error, must be reckoned the later partition of the country'. Menon goes on to say that the Muslims took advantage of the Congress being in the wilderness, supported the war effort and made the British feel that they were reliable friends. In a sense both the Congress and the League were gambling on the outcome of the war and the League backed the winner. In return for Muslim support for the war, the British were willing to do anything the League desired. In the beginning, British support to the League was not given publicly. The attitude of the Viceroy and the Secretary of State was correct, and Amery, in particular, made it clear that he did not favour partition. But many lesser, but quite influential, British officials did much to help the League, in some instances without the knowledge of their superiors. Though the majority of British officials favoured the Muslims, by no means all of them favoured partition. Menon is equally complimentary about Mountbatten: 'Mountbatten differed utterly from the Sardar on the surface, but he had the same method of work. Once he had accepted my plan for transfer of power, both in regard to its content and implementation, and subsequently while he remained as Viceroy and later free India's first Governor-General, he always ascertained my reactions to any matter of importance. It is hardly necessary to emphasise what we owe to him for steering us through the maze of conflicting interests and policies and personalities in Delhi in 1947. In fact, I think it is no exaggeration to say that without him the transfer of power would never have taken place. I must also pay tribute to his help and guidance in dealing with the communal situation after the partition, and the mass migration between Pakistan and India. He organised the Government's forces to deal with it, and the situation was brought under control in three or four months' time. No praise would be too high for these contributions'. Menon also clearly values Clement Attlee's contribution: 'Not the least among the British statesmen to whom we owe a great debt of gratitude for this happy consummation is Earl Attlee, whose modesty of expression conceals his firmness of purpose. As Prime Minister of Great Britain at the time, it was he with infinite patience and understanding, nay, conviction, solidly supported Lord Mountbatten in the onerous task of transferring power to India'. Lord Mountbatten was deeply appreciative of Menon's help: 'When I arrived in India in March 1947, I was indeed fortunate to find V P Menon as the Reforms Commissioner on the Governor-General's staff. I had never previously met him but I found immediately that his encyclopaedic knowledge of the Indian problem and his close contacts with the major Indian leaders especially Sardar Patel were invaluable to me - indeed it is fair to say that without the constant help and advice of V P Menon, the transfer of power as early as August 1947 would not have been possible. I wish therefore, to say that I do not believe it is possible to over-estimate how much we all owe to him for his service at that time: and I feel even now there are many people in India who do not realise how much is owed to their great countryman 'V P' as he is affectionately known to his many friends'. Mountbatten wanted to award Menon a knighthood but Menon felt that as the servant of the new Government, it would be inappropriate. Hence he was given a certificate. Following Sardar Patel's death in 1950 Menon's influence waned. He was not particularly close to Nehru. He was briefly Governor of Orissa in 1951 and a member of the Finance Commission from 1951-52. In his obituary, The Times said: 'After 1952 he was relegated to obscurity, in which he found some consolation through the composition of the remarkable books already mentioned'. He lived in retirement in Bangalore and died in 1966. Both Britain and India owe a substantial debt of gratitude to Sri Menon. Successive Viceroys over many years had tried but failed to formulate a plan for the governance of India after independence which had the backing of both the League and Congress. Menon's plan was the first and only one which succeeded in doing so. Though he is sometimes considered as being too close to Congress, it is important to recognise that Menon was instrumental in persuading Sardar Patel and then played a part in persuading Nehru on the need for the creation of Pakistan. If Menon had not produced his plan in Simla, the British might have had to hand over power to the Provinces without any agreed central authority. This could have led to civil war throughout India lasting many years, resulting in the deaths of countless millions. If Menon had not suggested getting the States to accede before partition with Mountbatten's assistance, the problems of Junagadh, Hyderabad and Kashmir could have been replicated on a much larger scale. Menon and Mountbatten accomplished more in a few weeks than others had managed in the previous twelve years. But for Menon's recall of Mountbatten to Delhi, the communal violence following partition would have gone on for longer. Without Menon's crucial interventions, India, today, would be a very different entity. At a time when so many allowed their judgements to be clouded by self-interest and emotion, here was one man who put the interests of the country first. Both his achievements during the period of transition of power and his subsequent writings attest to Menon's innate sense of fairness and his ability to empathise with the viewpoint of others. It was also astonishing, in the hierarchical society of the Raj, for a man of Menon's background to attain the highest reaches of government. It is surprising that a biography of Menon has never been written. It is, perhaps, most appropriate to conclude this paper with Menon's own judgement on British rule in India: 'From 1765, when the East India Company took over the collection of the revenues of Bengal, Bihar and Orissa, the British had gradually built up in India an administrative and political system hitherto unknown. They brought about the consolidation and unity of the country; they created an efficient administrative organization on an all-India basis; it was they who for the first time introduced the rule of law; and they left to India that most precious heritage of all, a democratic form of government. As long as there is an India, Britain's outstanding contributions to this country will continue to abide'.